Who’da thunk that there is a restaurant and deli that serves and sells Polish/Ukrainian/Chicago-Style food right here in The Duke City? Not I. 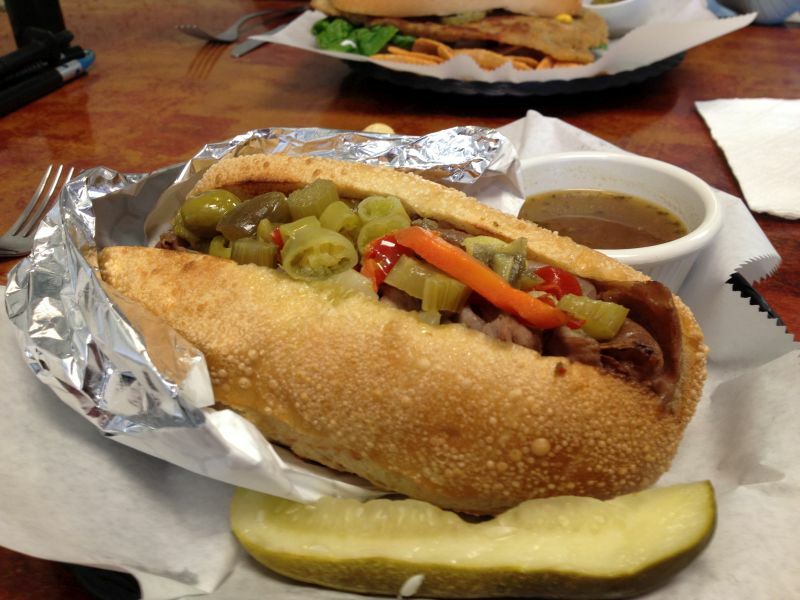 When my friend Gil Garduño — New Mexico’s Sesquipedalian Sybarite — told me that I could get a genuine Italian Beef (Chicago Style), I got the Dazzling Deanell to drive me over there as quickly as possible (but slower than Danica, if you please). She, being adventurous, complied. And now she begs me to go back. I will go here anytime with anyone wishing to go, but you must drive. 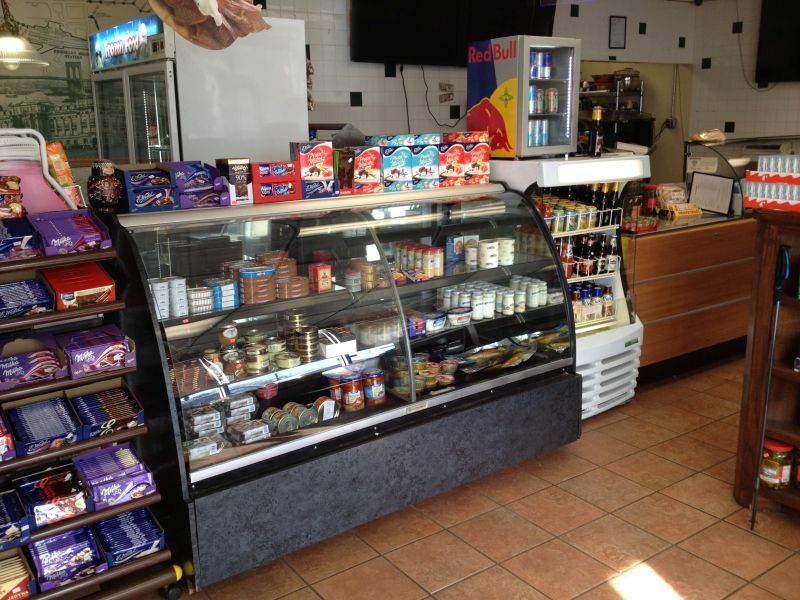 When I walked into the place, it looked as if I were in a deli/grocery. 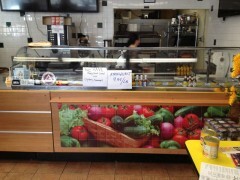 The booths and tables were hidden behind shelves on the left, filled with much that you need to cook Polish. 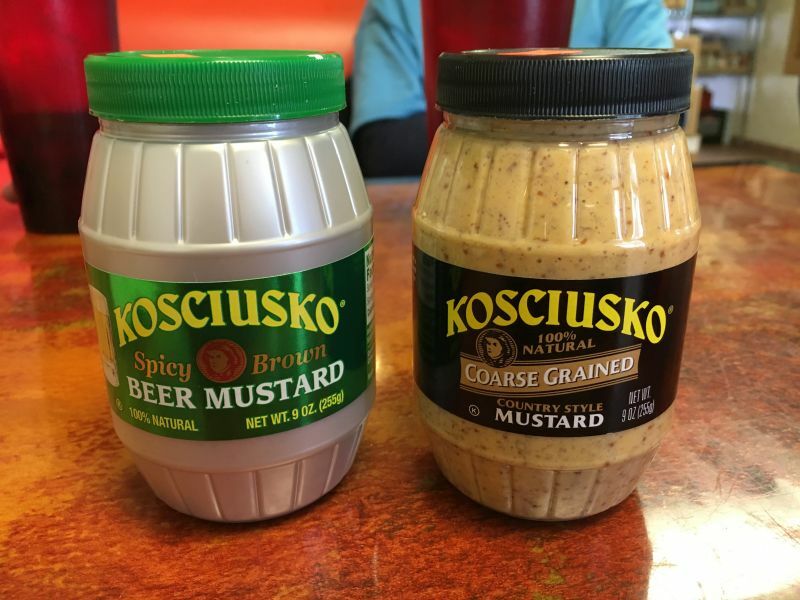 Mustards, sauerkraut, canned fruits and syrups, poppy seed paste for baking, dried mushrooms (the kind that are essential for making a proper Bigos), and the list goes on. 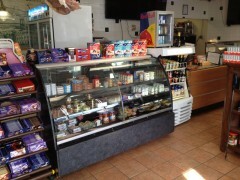 Another case displays sausages and other such goodies. Take some home. 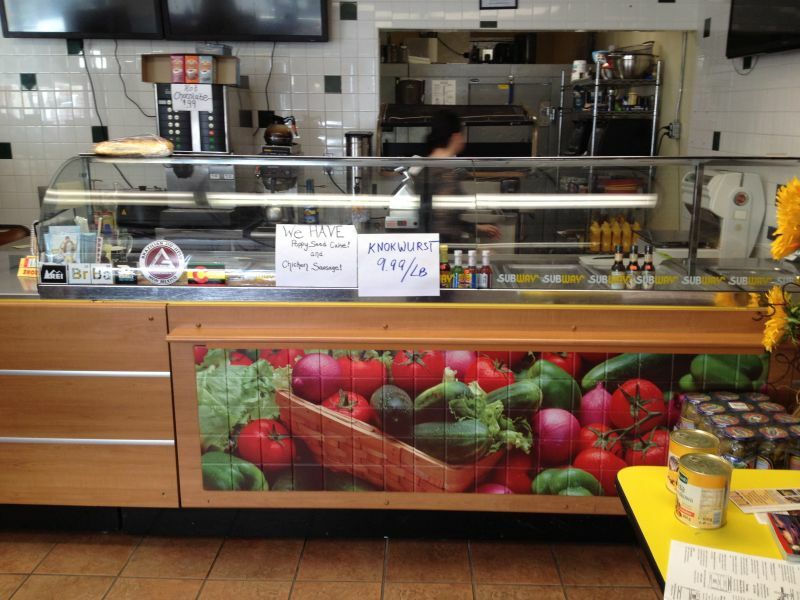 The lure of an Italian beef sandwich drew me here. 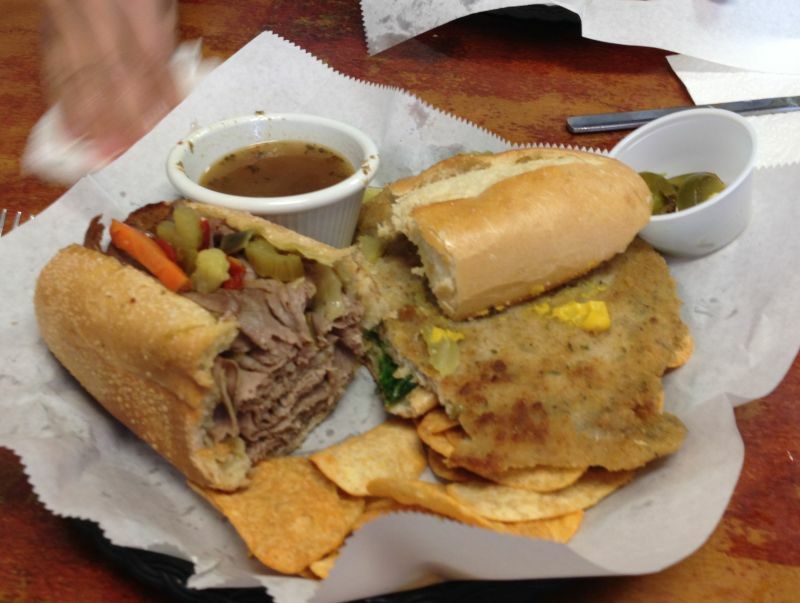 Since Deanell had never had an Italian Beef, we ordered one and a Lincoln Pork sandwich and split them. Good move. I lived in Chicago for 15 years. I ate Italian Beef in all the great places (Al’s #1 Beef and Portfolio’s were a few), and the Red Rock version wins hands down. Deanell had never even heard of Italian Beef, and swooned at her first bite. She talks about this sandwich continually. Quite an impression. Best I have ever had. Anyplace. Art Wienerschnitzel Lettuce, mayo, breaded pork chop, pickles, jalapeno, mustard. 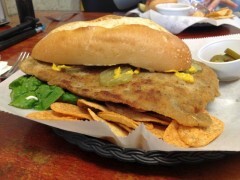 The name of this sandwich is a taleoff on Lincoln Park, which borders Lake Michigan on the North side of Chicago. 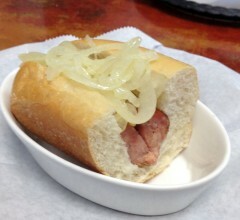 I lived one block from Lincoln Park, so Naturally I had to try this namesake sandwich. Pork, with sweet and spicy BBQ sauce, served on a hamburger bun with coleslaw. 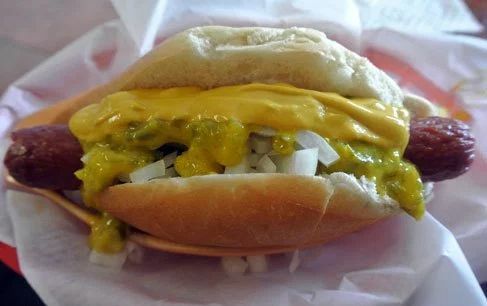 My favorite Polish in Chicago were at Big Herm’s in Skokie (now closed – sigh) and at Byron’s at Irving Park and Sheridan, just a few blocks from my condo and Wrigley Field. In Baltimore, I had many at Polock Johnny’s. Red Rock is right up there with the best. Not on the menu. This lovely soup is made by the wife of Mark, the owner. Beets, onions, potatos, pork, sour cream. This borscht is lighter in color and texture than that which you may have had before. Never mind, it is excellent. 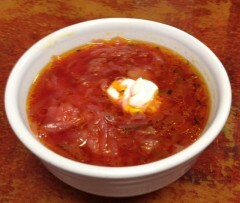 A traditional hearty Ukrainian soup/stew. Beef, sausages, carrots, potatos, onions, and spices. 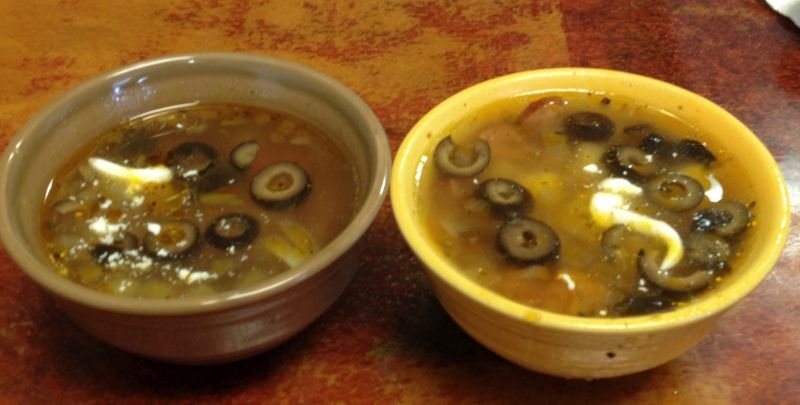 This soup is also not on the menu, but appears from time to time. Watch for the sign near the front door. The soup is unbelievably good. You need it. Beef with rice wrapped in cabbage leaves, slow cooked in tomato sauce. (when available — ask). Tender, lightly spiced, and delicious. 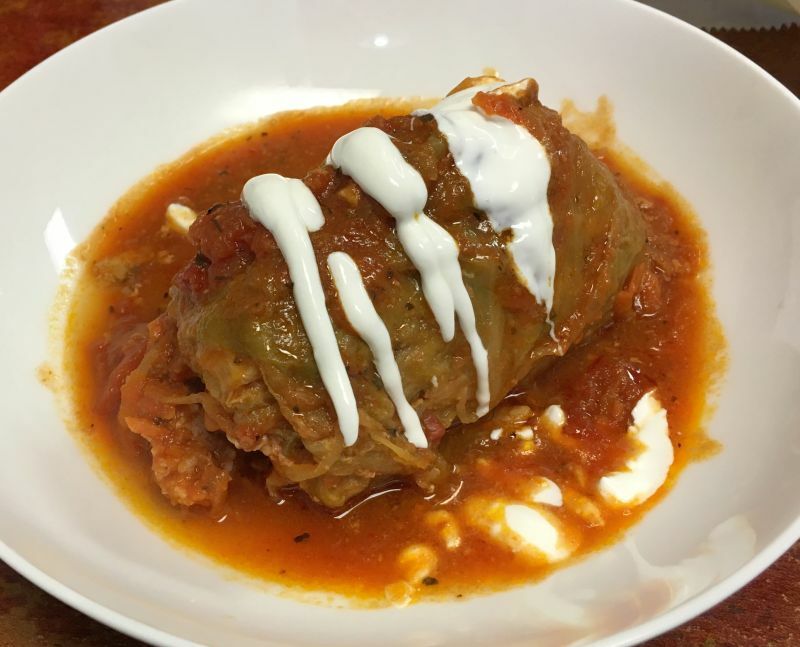 This marvelous dish reminds me of the stuffed cabbage made by my Polish neighbors in Baltimore. This dish is accompanied with a roll that you should use to sop up all the sauce. Just do it. 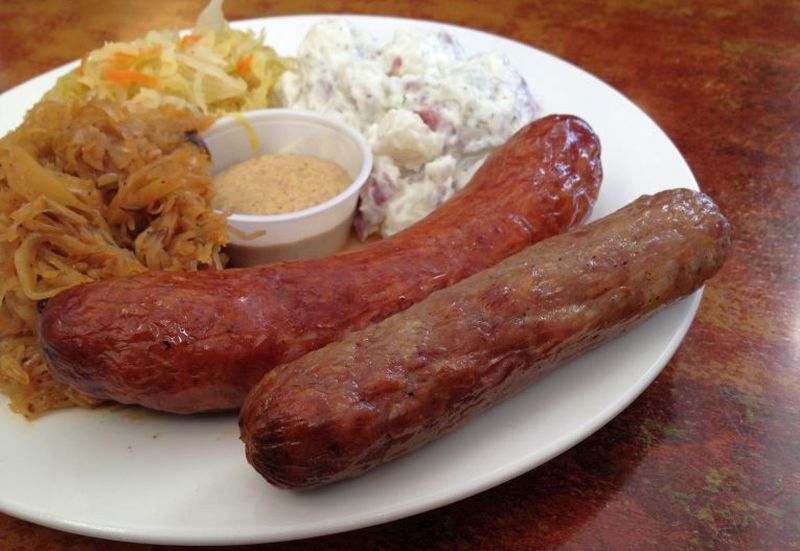 Polish sausage and a German beer brat served with sides of potato salad, sauerkraut and sauerkraut stew. This is the real thing, not like that junk you buy in the supermarket. The sauerkraut is perfect. The sausages are nicely spiced and juicy. The skin pops when you bite into them. The creamy potato salad is as good as it gets. This is a fabulous dish, and has made its way onto my Best Dishes of 2016 List. 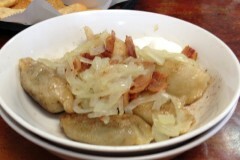 Pierogi . Dumpling made with 10 variants of stuffing Try them fried with onions and bacon. To get a representative sample, order the Russian Roulette. 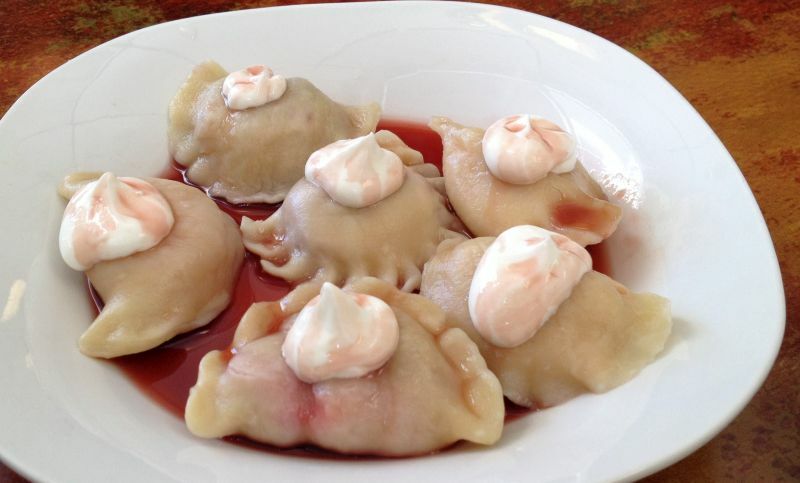 Mix of 6 different kinds of pierogi with savory stuffing, served with sour cream. My friend LP loves these things, and the version served at Red Rock easily earned her approval. Mine, too. There are two choices for dessert. 6 Dumplings stuffed with fruit fillings and sweet farmers cheese. Topped with sour cream and fruit syrup. These are quite a treat. If you like to experiment, get a smallish of onions and bacon on the side. Our server, Betty, appeared horrified at the suggestion. But the blend of sweet and savory is outstanding. Try it. 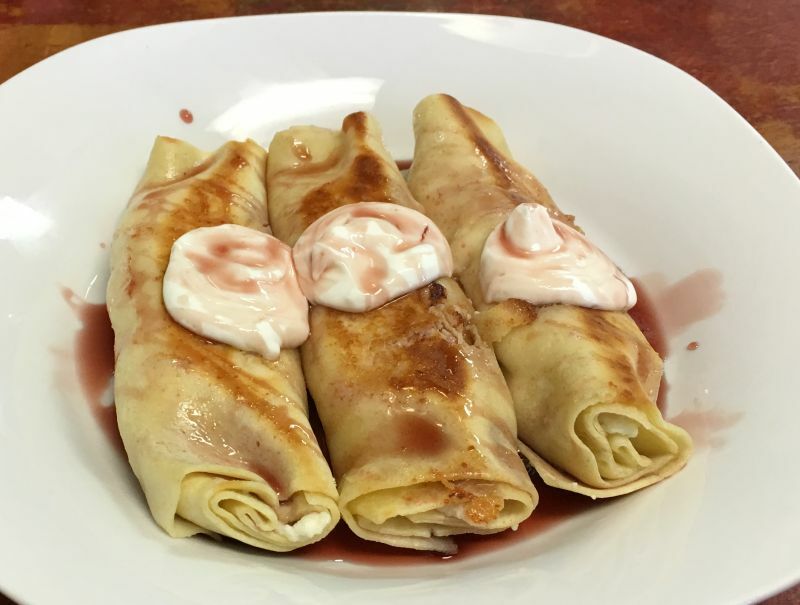 Blintzes stuffed with sweet farmers cheese fried with butter. Served with sour cream and fruit syrup. 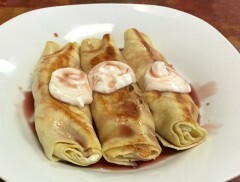 Most ethnic cultures have a version of Blintzes. 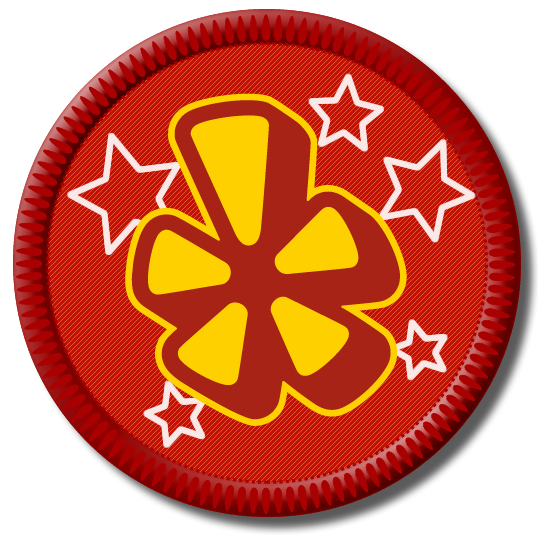 Those at Red Rock are especially rich and tasty, being among the best I have ever had. 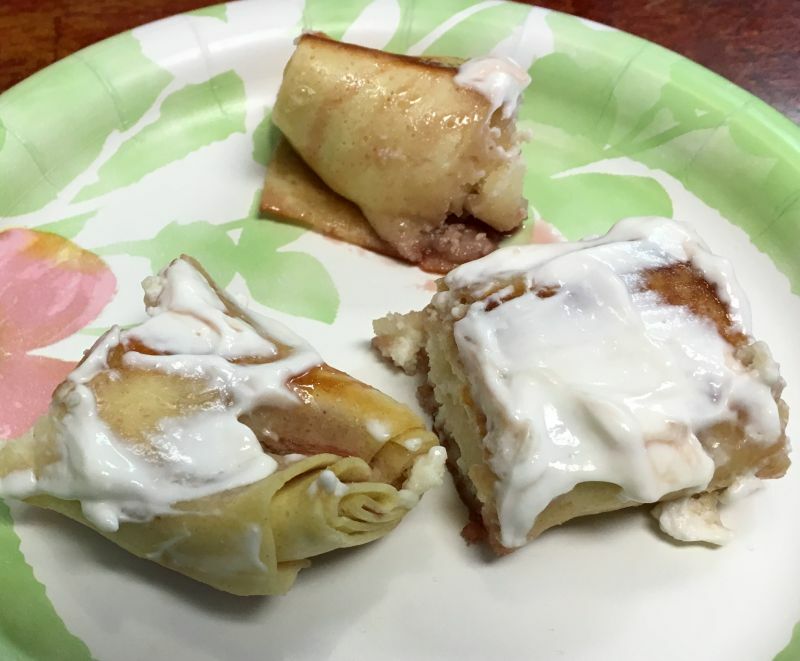 LP, Barb, and I shared the three blintzes in an equitable way. Next time, I shall order my own. These are too good to share. I am delighted to have found this place. Thanks, Gil. Now I can eat Chicago without the plane trip. “Cities such as Chicago have long realized that these ethnic enclaves offer a treasure trove of cultural and culinary experiences. Most of these neighborhoods welcome culinary tourism–the opportunity to showcase the cuisine of their homelands. “Chicago boasts of the largest Polish population outside of Warsaw (as many as 183,000 by some estimates) in the world. Storefronts and restaurants in “Little Poland” on Chicago’s far Northwest side are bedecked in the white and red flag of Poland. They offer everything from pierogies to kielbasa. Every Labor Day weekend Chicago celebrates its Polish heritage at the Taste of Polonia festival where Polish cuisine and culture are showcased. This entry was posted in Chicago-Style, Polish, Ukrainian. Bookmark the permalink.